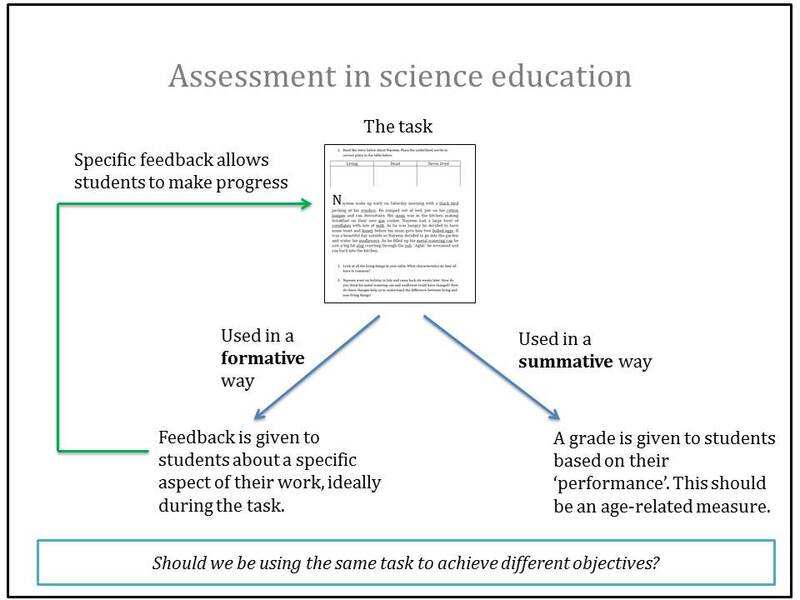 Assessment in science can take many forms but broadly involves assessment for learning (summative) or assessment of learning (formative). The importance of assessment for learning was highlighted in 1998 by Black & Wiliam’s review that showed students learn better when formative strategies are used. Assessment in science lessons can sometimes resemble a bit of a game show – traffic lights, thumbs up/down and confidence lines abound! Whilst whole class learning checks are important, they often provide only sparse information about student understanding and it’s hard to know how to respond. How does a confidence line work if all students don’t know anything? What do you do when 8/30 students have thumbs pointing in a different direction to the rest? Another problem with these approaches is they often take place after the activity itself and so feedback is too late to be meaningful – the window of opportunity has closed shut. Good assessment should come through well-planned activities. Students should be able to express and display their understanding as they progress through the task, with the teacher surveying and intervening when necessary. The use of challenge here is key, so that misunderstandings can be surfaced and immediate feedback can take place. A final point worth considering is the purpose of each assessment. Summative assessments provide a grade (i.e. tell you how students compare to their peers) whilst formative assessments provide the teacher and student with feedback, which should result in an action that leads to learning. If we try and use the same task for both formative and summative purposes we may just end up doing both badly. Black, P.J. and Wiliam, D. (1998) Inside the Black Box: Raising standards through classroom assessment. King’s College, London. Christodoulou, D. (2017) Making Good Progress? : The future of Assessment for Learning. OUP.